Totally awesome giclee from the Star Wars universe! A limited edition of 150 hand-numbered pieces. The giclee measures 22-inches tall x 17-inches wide! R2-D2 makes the journey to find Obi-Wan Kenobi alone. This Star Wars R2-D2 Artoo's Lonely Mission Paper Giclee Print is a gorgeous piece of artwork that depicts the off-screen adventures in the original Star Wars film of R2-D2 whilst Luke Skywalker slept. 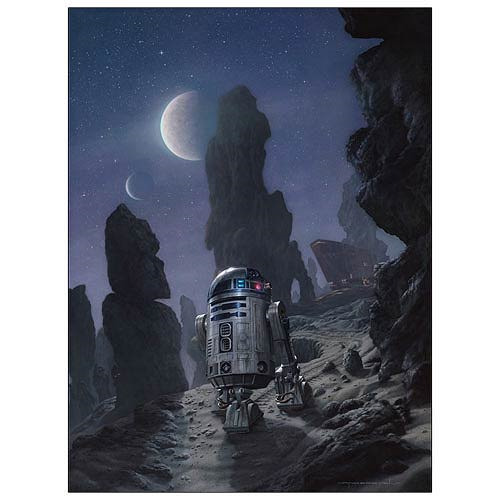 Featuring R2-D2 traversing the rocky expanse of Tatooine at night on the way to find his old master - a Jawa Sandcrawler eerily in the background and catching up to Artoo's position - this great giclee has been printed on paper and signed by artist Jerry VanderStelt. Measuring 24-inches tall x 18-inches wide, this fantastic print is a limited edition of 150 hand-numbered pieces! Ages 12 and up.